The reveal that, yes, reality actually works that way is the best sort of meta gag for the NBC sitcom, poking fun at the show’s endlessly iterating set of rules and systems, full of “afterlife points,” Medium Places, and burrito-scarfing, reality TV-addicted omniscient Judges. It also came from a real place of frustration with the series’ tendency toward rules-y naval gazing, as one of its writers recently revealed during a panel at Vulture Festival. 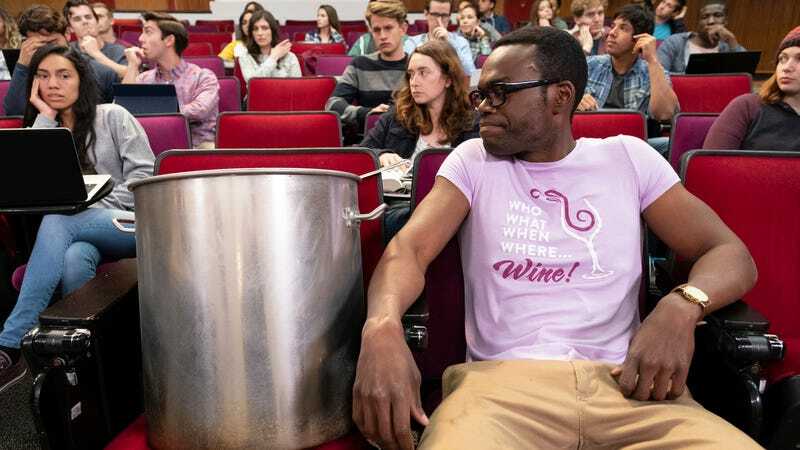 Per Vulture, new Good Place writer Rae Sanni was attempting to get showrunner Mike Schur to explain how the show’s various time travel shenanigans work, and repeatedly pointed out that none of what he was saying actually, you know, made sense. Eventually, the show’s writing team decided to just play into the absurdity, and thus J.B. was born. Originally, though, the name/shape of all space and time was slightly different; the first draft was actually “Jeremy Jeremy,” but was changed when Schur and co. decided to really make things silly by picking a name with an “i” in it , so that they could incorporate the dot into the structure of reality.